Not to be over-simplistic or anything but, when it comes to cigar bands, stogie enthusiasts fall into one of two categories: those that trash ’em and those that hoard ’em. For reasons heretofore unexplained, I fall into the latter category. I never had a good reason to carefully remove each paper ring that adorns the many sticks I’ve smoked over the years, cautiously straightening them under the weight of my torch lighter and haphazardly placing them in old, wooden cigar boxes (pictured). Like most pack rats—and this is the one and only item that qualifies me as such—I guess I always thought I would need them one day. But that day hasn’t come, and my mound of ornate and colorful bands keeps growing. So what do brothers of the leaf do when they’re up to their necks in cigar bands? Well, some trade them in for other (arguably more useful) stuff. 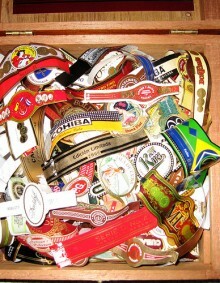 Bandwagon USA accepts cigar bands, as long as they’re on a pre-accepted list of manufacturers, in exchange for all sorts of items—from flasks and money clips to polishing appliances and luggage. Even some retailers, most notably United Tobacco, are in on the game, allowing fans of their products to trade in bands for company T-shirts, humidors, and LCD TVs. This option seems to be best for smokers who find little or no inherent value in the cigar bands themselves. Many smokers, however, do and therefore go out of the way to stash away their stockpiles. While the International Label, Seal and Cigar Band Society said back in 1994 that the popularity of U.S. cigar band collecting was dwindling, a quick search on Ebay reveals some are still willing to pay cash, albeit very little, for hundreds of bands. My understanding, though, is that you can’t get into this hobby expecting a big payout. The final cigar band option, if you’re not going to commit them to the trash, is to use them for decoration. I’ve seen homes with framed assortments of bands on the walls and, depending on the décor, it could work. My dream is to one day have a smoke-filled study complete with wooden bookshelves, dark green walls, and leather chairs. Perhaps portions of my collection could be on display there. But I haven’t decided what I’m going to do with my bands yet. One thing is for certain, though: I will hang on to a select group that were smoked on memorable occasions because (try not to laugh) they carry some sentimental value. Maybe I’ll trade in others for a cigar store Indian for my future den or a ridiculous coat. What will you do? You know, I never thought much about the value of the cigar band. Used to be, I pulled them off as soon as the ash got close to the band. But then I met my fiancee, who in the early days of us dating used to collect the bands from the cigars we smoked together. She had them all saved in a jar that was kept in the kitchen. Sadly, we hit a rough patch and for a time, broke up. Fences were mended, hurt feelings soothed, and not long after we got back together. We were sharing a bottle of Pinot Noir at her home…and I noticed the cigar jar with all the bands had disappeared. Turns out in a moment of anger, she'd thrown it out. Today, we're doing just fine. Lots of cigars have been smoked since and plenty more will be in the future. But damn, if I don't miss that jar. That coat is ridiculous–and I just bought it. Only 100 "band points" and $90. You can't beat that deal with a stick! I keep them and when finished, tape them into my moleskine calendar. It helps me look back reflect at what I was doing at the time or what my thoughts were. To me some of these bands are little works of art- some plain, some very intricate and complex. B Casanova, that is some nice work! You have some talent. I keep most of them too. I was going to frame some but I got to lazy. I began this collage on a lazy afternoon as I was pondering the same question you are asking here … what to do with all these beautiful bands I had been saving. It is presently 23 x 34 and I think it is time to start fresh on a new piece. At last check, the frame shop wanted $200 to frame it with a couple mats. It may be worth it. My local B&M owner has offered me $500 for it (or a few boxes of my favorite cigars). Definitely worth the effort. I keep all my bands in a small 4×6 photo album. I cut construction paper (black/blue) to the appropriate size and use a glue stick to paste the bands on. The smokes I liked go on the blue cards. The ones I didn't like go on the black cards. It's a good way for me to look back at the cigars I've had and remember which ones to buy again. I have a steel cabinet in my basement workshop. You know, the ones that arre painted off white or "putty". I take a little glue and glue them to the thing. I also have various decals of auomotive and firearm related products stuck all over it. Not sure why but I like it! I've been collecting lables, only ones that I've smoked :-), for about 8 years. When I hit about 500 lables, I'm making a 2' x 4' coffe/cigar table with the top completely covered with lables. Anyone on this site interested. I make bracelets wish Cuban cigar bands. I sell on etsy. Funny the things you can become so interested in. Most of the 15k+ bands I have are little works of art. The links and resources posted by you in the blog are very useful for me! I was looking for Stogie Tips: Up to My Neck in Cigar Bandsexact and particular information for a long time. Thanks.